As long as I could remember, we have dogs and different pets at home. My parents allowed us to take care of them, I learned about compassions, responsibilities, unconditional love and being a leader in the pack. I had my own very first litter of poodle puppies when I was 14 years old back in Taipei, Taiwan. I was fascinated by how smart they are, their curly hair, and amazing sweet and loving temperaments. 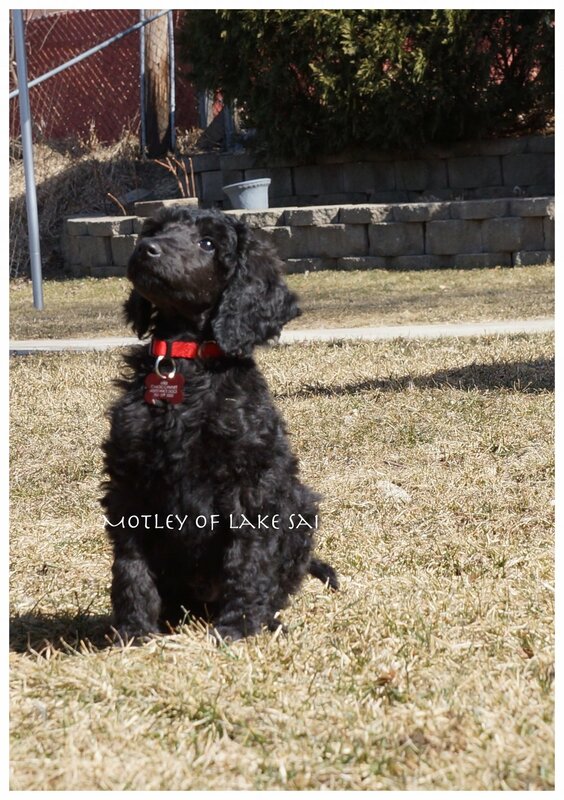 When I received a two-year fellowship award from The University of Illinois at Chicago for my graduate study, I purchased a standard poodle-Pancake the first week when I just moved. He has been my family and support all these years. Pancake came to my artist studio working with me, walking home with me. His friendly, loving, and unique goofy personality earned a lot of attentions. Pancake saved my life 4 times while I was walking back from school late in the dark, and during our hiking at Appalachian Trail. He stopped in front of me, and growled at the strangers who tried to approach me. Pancake is the an angel God bestows to me, guards me, loves and accompanies me all the years. Now, at the age of 14+, I would like to extend the love and serve he has giving me to others. I donated 4 standard poodles to a non profit organiczation Can Do Canines in March, 2017. I am delighted to see they are doing great in the program with their host families. I will continue this program as long as I am breeding. We are so happy and grateful that Striker is here with us. 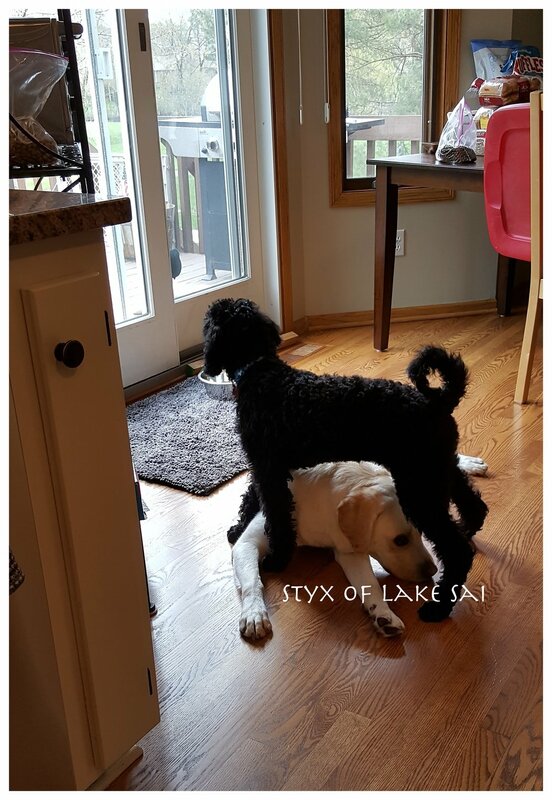 Striker is back to Lake Sai Poodle. He stays next to me by the bed. He loves his new home and new mommy…. When I met him the first time (July 2018) at Jane’s house I was in love with him. He sat next to me, asked for attentions. Not moving at all. Jane told him to leave us alone, but he came back to me again and again every few minutes. I admired his calm and pleasing energies since. 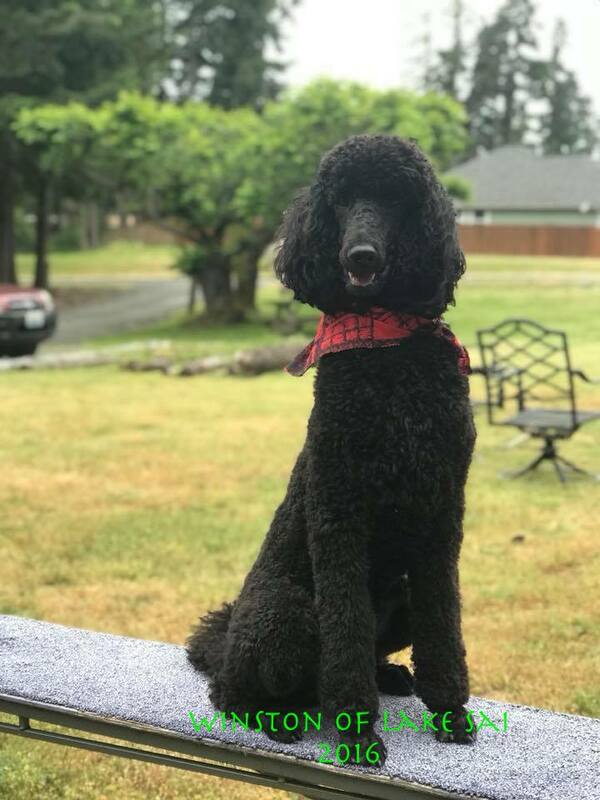 His gaits, his structure, his beautiful and correct head… I mentioned to Jane about my dream is to build a Non-profit Service Dog program in the near future, and Striker will be one of the perfect foundation for the program. 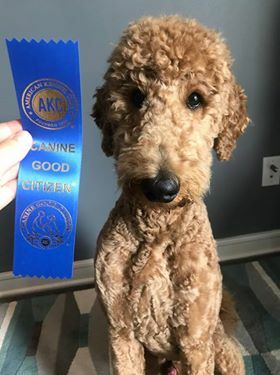 Jane is a wise, compassionate and generous master groomer and poodle breeder, there are 7 Grand Champions and 24 Champions poodles from her breeding. I am so lucky to know her, and able to work with her. I adopted two sliver standard poodle girls for my Dream Service Dog program then. They are beautiful, sweet and playful! In Jan. 2019, I started to be serious and meditating on my Projects & Visions for the next 3 years, and the Service Dog Program was on the top of the lists. Two days later, Jane called me, and told me she would love to support the project and willing to donate Striker to my dream project. I was beyond excited, feeling this is the best evidences that WE NEED TO COME FROM OUR DREAMS…. I stayed at Jane’s house that evening I picked up Striker…. 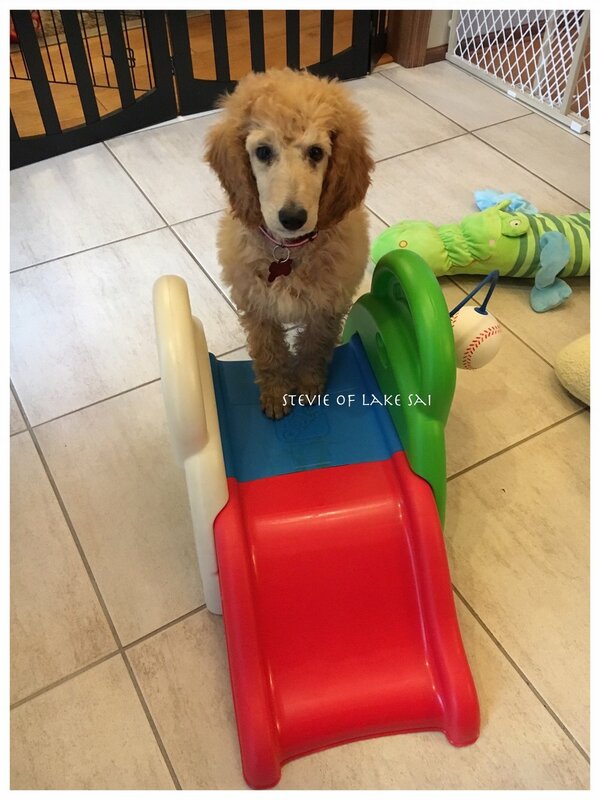 Jane shared with me great insights of her legacy of being a great breeder, master groomer…. 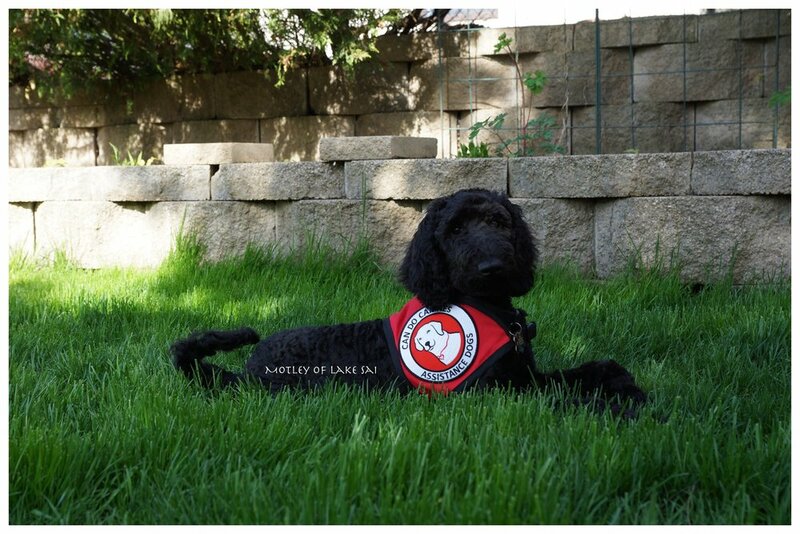 I am so honored to call her as a friend and partner; we are so excited about how we can extend our love and passions of poodles, and our beloved poodles can be possible helping others who can use their services..
That morning, Sticker knew he was coming home with me. He said Good-bye to Jane, and hopped on the car. We start our journey together that morning. I love you!! Striker!!! Ozzy is a sweetheart! He loves to be touching and be touched by his person. Absolutely no shyness of people. I find I have to work on keeping his attention when we pass people because he wants to investigate them. He is certainly more cautious than a lab, but his confidence has grown immensely from day one. Has very good confidence in outdoor settings. The photo was taken before he was getting his first grooming. and goes to Brainerd almost every weekend. Does excellent in the car. He can sit, down, stay, shake, wait, under, and nudge. He is a very playful happy boy who is getting more affectionate. He lives with another Can Do lab, and a Bichon. Motley is very smart and a hard worker. In the evening, he often wants to work and will sit next to one of us and nudge our leg. That is our clue to get out the retrieve items to practice. He is growing quickly, getting tall and as of today he weighs 26 pounds. He is still working on filling out, but is eating well. He loves to play with Buzz, the other puppy in training living with us, who is 10 months old. When tired, they often lay next to each other to nap. Today was busy with a couple outings followed by class at Can Do Canines. He just fell asleep in the living room with a toy in his mouth. Motley is a quick learner and is starting to enjoy his snuggle time. Stevie lives with a lab who is also a service dog in the host family. She is smart, willing to learn, and a hard worker in the program.